Everywhere I go,I see these cute toddlers,well dressed,hair nicely combed,hair clips in place,shoes and socks on.Oh! don’t they look oh-so-adorable..? And then there is my toddler.Getting her dressed is such a BIG drama,every single time!If she had it her way,she would still be wearing the same t-shirt from 3 days back.Trying to change her clothes is nothing less than a feat. There is screaming-hers and mine , heavy panting-mine and angry crying-hers. T-shirt tackled,time for pants/skirt- Rinse and repeat the drama mentioned above.Have ever tried to put some pants on a crocodile rolling in the mud?No?Really?I do it every single day! As soon as its time to put the pants on,the crocodile rolling starts..kicking and rolling..and God forbid if I pick out a pair of tights to go with the socks..the whole exercise is enough to make me start pulling my own hair !! And there is no chance of putting on a dress.. doesn’t matter how pretty it is..doesn’t matter how cute she looks in it..Nope!She doesn’t do dresses..The rare occasions when she is distracted and I put one on her,she screams and cries and asks to take it off. Oh and the hair!! Let me not even get started about that.. She hates getting her hair brushed…even before the hairbrush touches her hair,she starts saying”Owie” …LOL!I am not kidding..I try so hard,holding her between my legs or putting her on the bathroom bench top.. and finally she is dressed..fairly well dressed. But by the time we get to our destination(even if its 5 minutes away!! )..the shoes & socks are kicked off,the hair clip is off and her curls have sprung.Seriously!What am I to do with her? I hope she’ll out grow this phase because I am seriously dreading her teenage years. 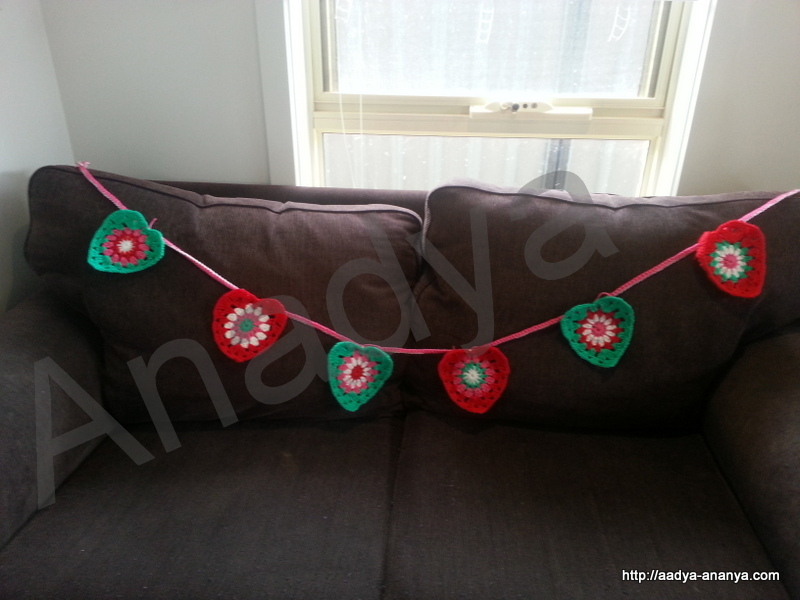 On that happy note,let me share with you something else that makes me happy..A Bunting.I finished this bunting yesterday. The Bunting is up for sale on my facebook page and will be going with me to the market stall,in October:) Not-so-subtle business plug..LOL! I’ll back with another post soon…Trying to keep my head over the water…as life comes at me,yet again like a big wave,trying to drown me.